2014-05-20: My Risa Uke Solid arrived yesterday from ukuleleworld! Thanks to UU forum folks for their advice when my A string slipped off of the tuning peg. Thanks also to Roy Cone of ukuleleworld for his helpful advice. In summation, the Risa Uke Solid plays easily and evenly, sounds very good, has excellent intonation, and is very well thought-out in its design. The finish on mine is flawless, too. (And I am unreasonably picky.) So, if you don't mind an unconventional style, it looks great. If, as I suspect, the Soprano and Tenor models are as high-quality as my Concert, these instruments are among the best ukuleles you can buy. They stack up with the best Hawaiian and hand-made ukuleles out there. Comparison of Risa Uke Solid vs. Eleuke-Peanut, another solid electric ukulele. 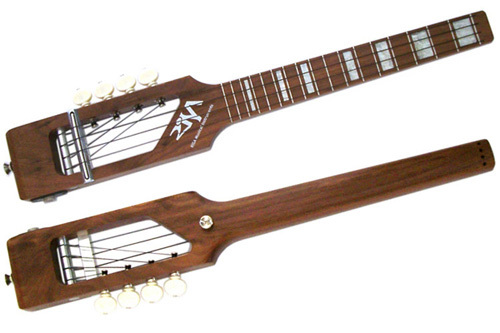 The Peanut is around $120 vs. about $300 for the Risa, but the Risa is a much nicer instrument. 2008 review of Risa Uke-Solid with mp3 sound samples. Good discussion in the comments about amplifiers. Solid Blues Shuffle by Rigk Sauer (the guy who designed the Uke Solid) - all three sizes appear in this video. Great electric ukulele sound. Wacky video entry on why to buy a RISA Uke Solid - caution, a Risa is destroyed in the making of this video! But some nice playing along the way. Begin the Beguine - Steven Strauss on soprano Uke. It looks like there is a tuning change midway through...? Clocks cover on ukulele by Jan Laurenz - on a tenor Risa Uke-Solid - beautiful! Earlyguard: Busy Bee (Ukulele) on a Concert Risa Uke-Solid -- very nice. NOTHING ELSE MATTERS(UKULELE) - Risa Uke-Solid Soprano with the Danelectro Honeytone Mini Amp. Nice clean tones. ukulele.de, the site owned by the guy who designed the Risa Uke-SOLID. One forum site noted: "The Risa site would be shipping through USPS Priority Mail and I did some research which said I could be paying up to $16 in duty fees." -- About $350 with shipping + $17 would be $367. Ukulele Pua Pua - $359 there + $15.10 Priority Mail 3 Day = $374.10. ukuleleworld in Texas - Tenor is $379 with free shipping. Which size would you choose for a beginner? : I've owned all three sizes. I sold the soprano when the "one in, one out" rule was in effect, and the concert replaced it. I've since gotten a tenor. They are great instruments. The concert is my favorite size in general, but my tenor gets lots of play time. The tenor has more alternate tuning possibilities (mine is tuned dGBE), but the concert fits in my backpack better and gets taken on more outings. best mini guitar amp -- a very nice comparative review. What to do about sharp fret edges that might come without proper humidity? Unwound low G on Risa Solid concert stick uke? chordie - has guitar and ukulele tunings of many songs and artists, including many public ukulele song books that gather these up. Uke Jams (591 songs) Nicely formatted songs that fit on 1 page. San Jose Uke Club (679 songs) Formatted to show measures and alignment of beats to syllables. I'm just an ordinary guy without any ukulele experience (as of 2014-05-11). I have an acoustic steel-string guitar that I've toyed with on and off over the years but have never gotten to the point of sufficient protective callouses. I spotted the Risa Uke-Solid while browsing portable instruments online. I've seen comparisons with the Traveler Ultra-Lite Ukelele, but the Risa looks to be the nicer instrument for a similar price. There appears to be quite a lot of information about the Risa available online, so I thought I would organize my research in case it is helpful to others.